Recently on my Facebook newsfeed there have been numerous stories about how restaurants have taken on the social responsibility of helping feed those in need through the ‘Paying it Forward’ (PIF) initiative. I love the idea, but more importantly I love that it works, helps someone in need and most importantly it is anonymous – people are not doing it to get there two bits of publicity. It’s a humble way to show generosity: an act of charity in which donors and recipients never meet each other, the donor doesn’t show off and the recipient doesn’t have to show gratitude. There are people out there who are homeless, destitute, penniless, hungry and cold – very often not by choice – and what the PIF initiative does is allows them to have a warm, welcoming environment to have one decent meal a day. 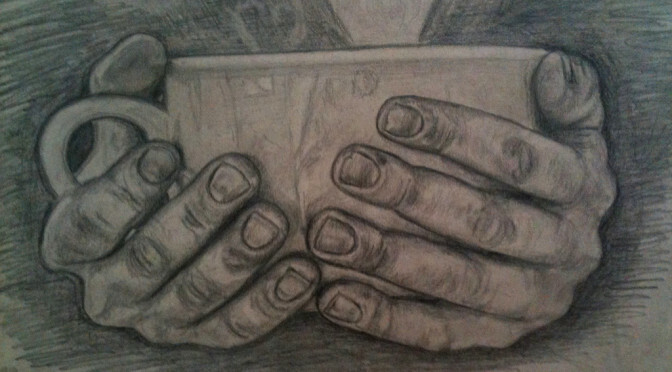 Since this is a food blog, I will focus on the PIFs when it comes to one of our basic necessities – Food/Drink. The phrase ‘Pay it forward’ became popular in the year 2000 with the release of the movie, Pay It Forward, but then really took off a few years ago when customers began paying the bill for the next person in line at a fastfood joint or similar establishment. So I went online and read stories about PIF and there are many of them (not necessarily only food-wise) – each one more heart-warming than the one I read before. I wanted to share some of these with you because it taught me that any random act of kindness can cause a positive ripple effect restoring our faith in the love and compassion of the human spirit. The suspended coffee is a Neapolitan tradition that boomed during World War II (although all my research has pointed out that this tradition started in Naples over 100 years ago) and today has found a revival in recent years during hard economic times – they call it caffè sospeso — “suspended coffee”. Naples is a city well known for its beauty, chaos and grit, despite which, or perhaps because of them, its people are also famous for their solidarity in the face of hardship. No one knows precisely when or how the suspended coffee began, but the fact that it started in this beautiful city speaks volumes for the kindness that Italians are known for. In Italy, suspended coffees is much like a tradition and it would be unfair to just name a few cafes, restaurants – I believe it might be a shorter list, if I mention the ones who are not party to the initiative. Mason was working on Wall Street when things did not seem fun anymore. He always wanted to own his own business, so he went back to Philadelphia and started Rosa’s Fresh Pizza to sell pizza by the slice for $1. He believes that you can still run a successful business by giving back to the community – he allows his customers to pre-purchase a slice of pizza so that those can be given to the homeless people who walk in. 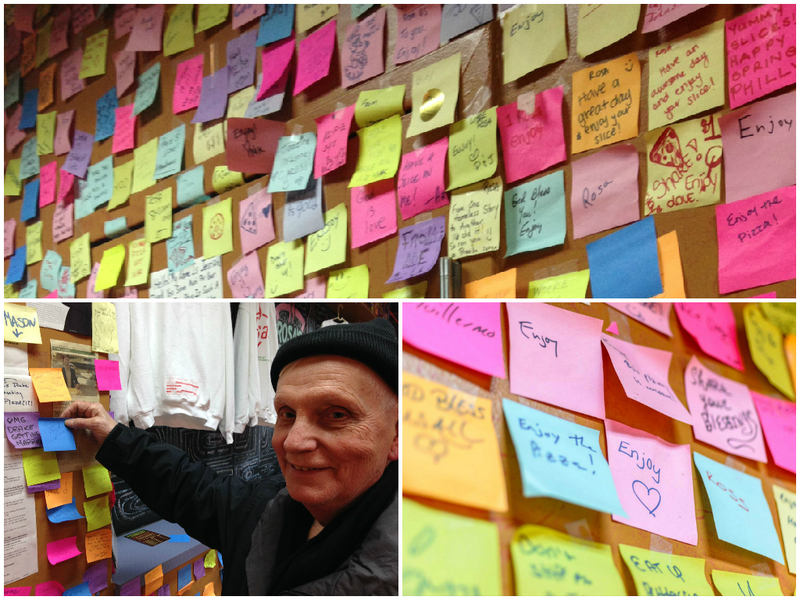 Each customer who pays for the $1 pizza to pay it forward, put a post-it on the wall, so a homeless person can walk in, take a post-it off the wall and trade it in for a slice of pizza. If you watch the video (bit.ly/1I0o3Vf) you will see customers who have benefited when they were down and out, pay it forward when then they are able – goodness comes back full circle. When Ashley, a sandwich shop owner, realised that someone had been digging through the trash bags containing discarded food, she left a touching message for the person on the restaurant’s front door and on the dumpster. It read – “To the person going through our trash for their next meal; You’re a human being and worth more than a meal from a dumpster. Please come in during operating hours for a classic Pb&j, fresh veggies, and a cup of water at no charge. No questions asked. 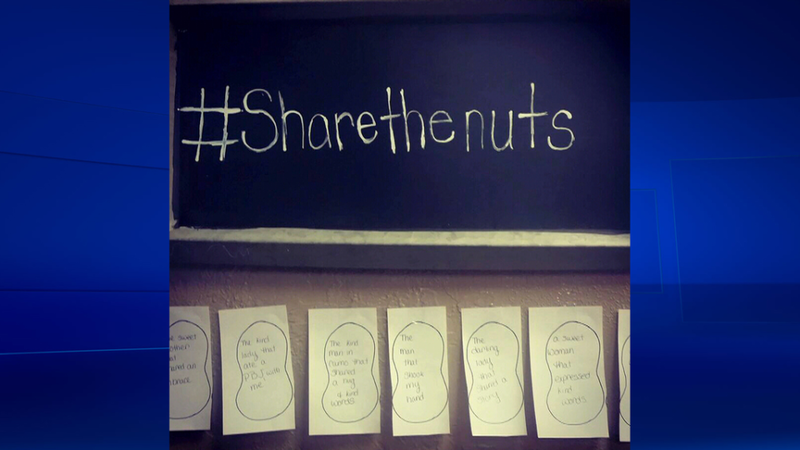 – Your friend, the owner.” She has started a campaign she’s calling #ShareTheNuts where a customer can offer to pre-pay for a sandwich for someone who cannot afford one, leading to a little note posted on the wall in the restaurant. Go online, there are hundreds of stories that will warm the cockles of your heart. 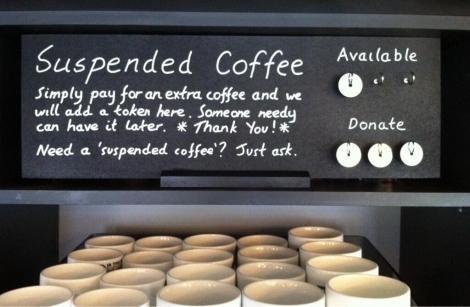 I limited this blog to just 3 (and I feel guilty for doing the other PIF cafés who run this initiative – http://suspendedcoffees.com/ injustice by not mentioning them – but I hope with these 3 stories I can trigger a teeny-tiny flutter which will make someone PIF). Although I have spoken about PIF in term of food, you don’t need to limit this initiative to only food. I have had many people come into my life who have helped me at certain points in my life (generally speaking), and although it is important for me to be appreciative of and thankful for their help by ‘paying it back’, I have begun to realise how important it is to ‘pay it forward’ – to try and help someone I may not even know, complete strangers perhaps. The truest way to honour those who have helped us along the way, is to turn around and help the people who are struggling now, even if you don’t know their names, and even if they will never know yours. I would love to know if there are any cafes/restaurants in Dubai who have the Pay It Forward initiative as part of their DNA. Note : The stories I have chosen are random – I don’t know these people or the cafes personally but their stories have inspired me and given me food for thought. Photos have been taken either from the restaurant’s home page or Google Images. Thanks Nancy for sharing the link – I will go and check it out. But it would be great if Dubai introduced this kind of initiative, not sporadically during Ramadan but through the year.